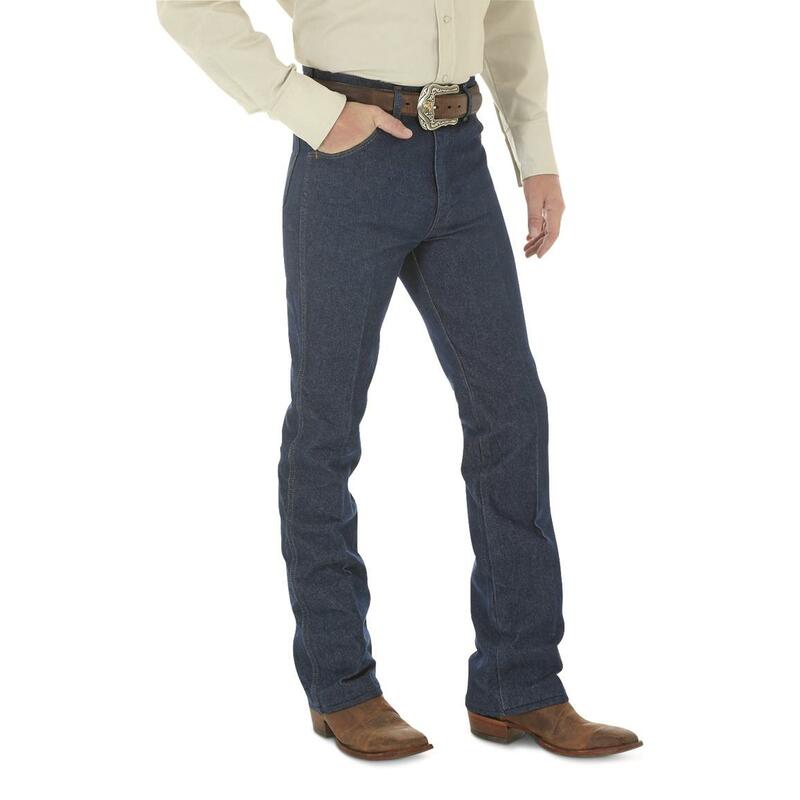 Heavyweight denim in a slim fit…with the comfortable Cowboy Cut® waist. With generous pocket space. Note: these Jeans are "rigid jeans". The fabric has been processed to minimize shrinkage; however, the Jeans have not been pre-washed. You may experience up to an inch of shrinkage in the waist over the first several home launderings. Order these Wrangler® Jeans and get them sent right to you! 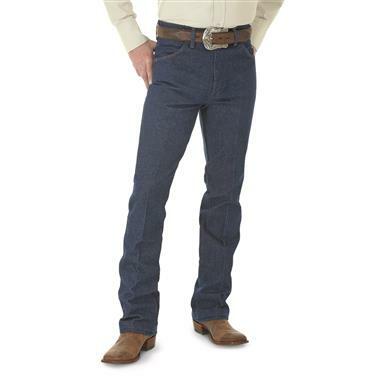 Wrangler Mens Cowboy Cut Boot Slim Fit Rigid Jeans is rated 4.5 out of 5 by 60. Rated 4 out of 5 by Ll18 from Good deal Seem to be well made but also slightly small for size. Great value ! Rated 4 out of 5 by Rick 22 from Good price! Just got them and seem to fit good, but still washing them several times as directed, so haven’t worn all day yet. Rated 5 out of 5 by Blackhorse from Customer service Only jeans i buy. Rated 5 out of 5 by Joe from Best bootcut jeans I have ever owned!!! I have been wearing these jeans for around 10 years. They fit well with most boots, shoes, sneakers, and even sandals so I really love them. Also they are good for work and leisure. Rated 5 out of 5 by TLM from Confort, Quality and value Was a Rustler wearer for many years. Couldn't find them anymore because Wrangler bought the company. Was skeptical that Wrangler wouldn't make jeans the same way as Rustler but was pleasantly surprised. The company representatives were extremely helpful and patient. Explaining the various "Fit" concepts from high waist to slim, regular and straight. Will be buying all my jeans from Wrangler. 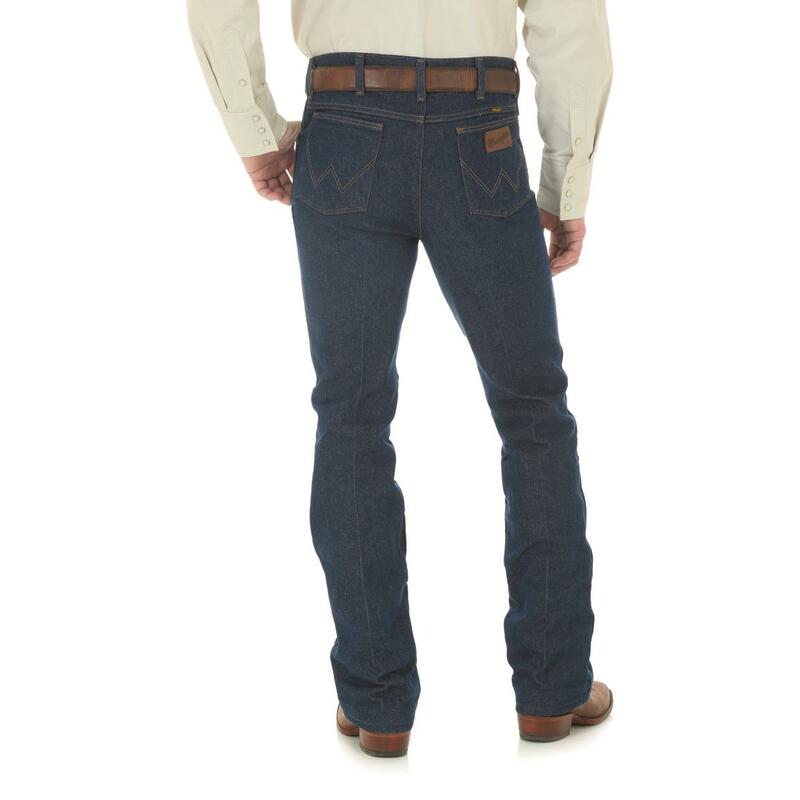 Rated 5 out of 5 by Whispering Wind from I will buy this product again I prefer rigid jeans over those that have been prewashed, sanded or any of the treatments that take the life out of the jeans---rigid jeans wear much longer and I think they look nicer with the natural wear. I have been buying these rigid jeans, 34X34, Cowboy Cut Rigid Slim Fit Jeans since the 1980s and they still fit me well. I do think that they were a heavier weight denim and the quality was better when they were being manufactured here in the USA. I am willing to pay more for these jeans if they would bring back their manufacturing facilities to the USA. I like USA made items because the quality is better and it saves our jobs. I know the denim is manufactured here in the USA but they are not sewn in the USA. Wherever you move, they move with you.